After getting into a car accident, you wander into a mysterious graveyard while searching for help. The doors slam shut behind you and you realize that you are trapped! Escape from the eerie Redemption Cemetery by helping trapped spirits save their loved ones, and free their souls! 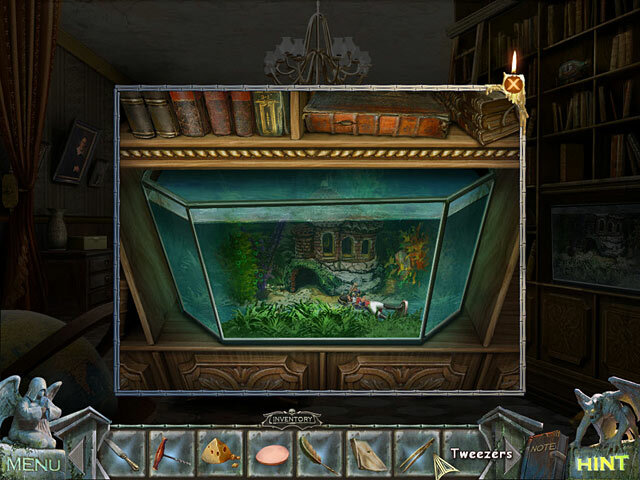 Use your Hidden Object skills to help these ghosts and escape, in Redemption Cemetery – Curse of the Raven! This is a special Collector's Edition release full of exclusive extras you won’t find in the standard version. As a bonus, Collector's Edition purchases count toward three stamps on your Monthly Game Club Punch Card! 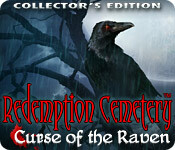 Redemption Cemetery: Curse of the Raven Collector's Edition is rated 4.5 out of 5 by 34. Rated 5 out of 5 by Kay_Erin from Another Oldie but Goodie! On playing this game again after several years, I think it holds up amazingly well considering it is about 7 years old.Unlike a few of the lesser made games, I can still play this one, although it takes a long time to load because it doesn’t recognize I am in the correct resolution (600x900) but it eventually does. Compared with today’s games, it is pretty bare bones, having no map, and the hint button is slow to refill. You spend a lot of time wandering round without the more modern additions of morphs and collectibles to keep you alert (or distracted!) However, a strong and well written story line and beautifully drawn layout keeps pulling you along and the HOS are excellent. In those days HOS were the main focus and there were fewer puzzles, which suits me as I prefer the adventure/hos aspect: I think that often the puzzles are used as "filler" and only distract/interrupt the story line. The main game is divided into 3 stories where you have to help someone rest in peace by correcting the past for them. The bonus game is similar but here you need to find the killer of two lovers and reunite them. All are very well written stories, and challenging. Oh yes, and the "extras" are limited to music tracks, screen savers and concept art. This game has its own unique charm and was excellently paced; I was drawn on to play to the end, with very few hints. (When you press on the hint button a group of bats fly to the correct place, IF you are in the correct scene!) My conclusion: an excellent start to an outstanding series and still worthy of CE status more than 7 years later! As someone else has noted this is a darker game and probably not suited to very young players - (one story has a young child trapped in a fire) use discretion in offering to younger children. Rated 5 out of 5 by kerith90angel from Based on completed CE This is an older game but I loved it so much at the time after playing through the SE the first time that I went back and I bought it again as a CE. I've actually played it through twice. I love how they break up the chapters with innovative stories. Chapters are divided to save several different characters from ending up in the cemetery and reverse the outcome to a good one! To date I feel it has one of the best storylines I've ever played. You actually have a real desire to help the individuals and feel a need to keep playing to save them! SINCE upgrading to the CE of this game, all those years ago, I have purchased the CE to every Redemption Cemetery in the history of this series. I love how Amax/ERS adds screensavers to their games and they are always great ones. The screensavers and bonus play is what makes the CE worthy to me; but I also like having the strategy guide. Along with the other RC in the series-- I think these games are similar so if you liked this one maybe try the demo to these here @ BFG: 1. Haunted Halls: Fears from Childhood 2. Reincarnations #3: Back to Reality (all 3 great) 3. 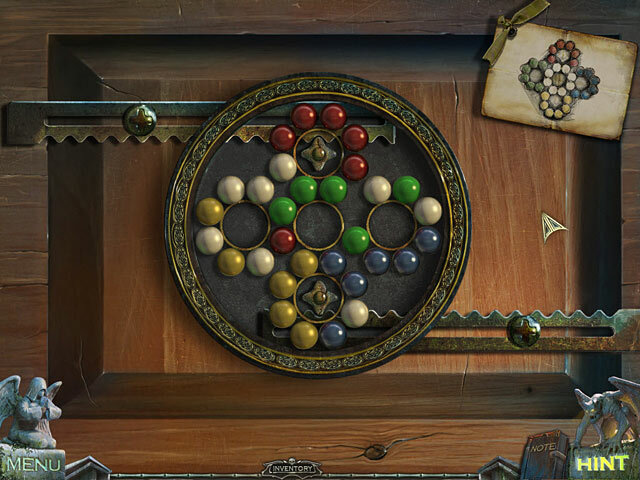 Mysteries of the Mind: Coma This very game started my great love for the HOPA genre. Play the demo and see if you love it as much as I do. Personally, it still stands the test of time. Thank you Amax/ERS not only for this great game, but for the RC series in general. It's a favorite!!! Rated 5 out of 5 by neilskinut from there all good Cool game and ERS has added new ideas to this one. Has a map and hint button works good. Good voice over and graphics. Music is also good, not distracting. Has a good flow with not too much going from one seen to another. Has a map which helps. You have to find things also for the dog. Some of the puzzles are harder than others. I did not find too many HOS but they are normal. I have all the redemption cemetery games and they are all good, this one I think could be the best. You have a crow that will also help you. Again good game. Rated 5 out of 5 by Powrtoc1 from Love this series Finished Novella One, great story, great graphics. The sense of urgency felt very real, and I was going as fast as I could to save the little girl. (whew, I'm out of breath!) The only drawback I found in the game was the items in the HOS were very tiny and hard to see. The HOS were very cluttered as well. Rated 5 out of 5 by Taintedfury from Ghostly Love Adventure... I truly enjoyed this game...eerie atmosphere accompanied with the tragic love story. 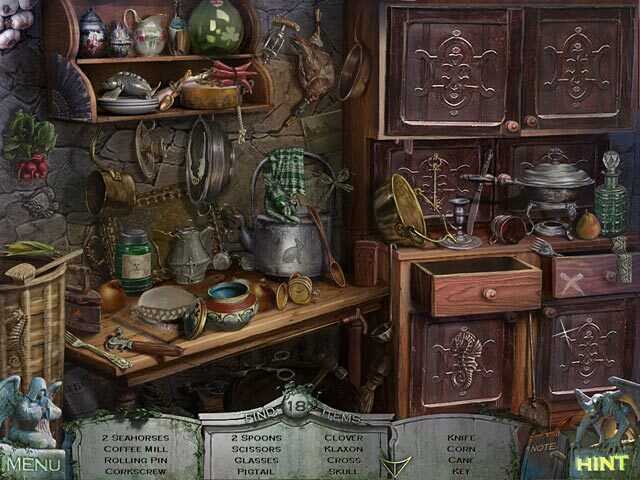 Heaps of great puzzles too do, loved the soundtrack and most of all great wallpaper's too. Highly recommend this game.. Rated 5 out of 5 by Torpedo1 from Redemption one of my Favorites There was nothing not to like in this one. It had everything. I will add it to my collection. I will be hanging on to the edge of my seat till pay day to own this one. Rated 5 out of 5 by sapoe from super! Another great games from ERS. I'm trully having fun and enjoy playing this game 'til end. Thanks dev! Love it!